How do I replace the maintenance box? Make sure you have a new maintenance box before you begin. Caution: Do not reuse a maintenance box that has been removed and left uninstalled for more than a week. Keep the maintenance box away from direct sunlight. Press the power button to turn off the product. Remove the new maintenance box from its package. Caution: Do not touch the green chip on the maintenance box. Press the tabs and remove the duplexer (rear cover). 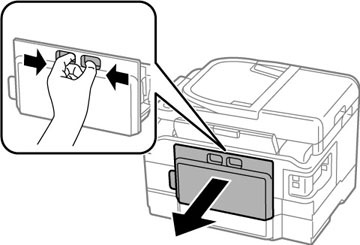 Grasp the maintenance box as shown and pull it out of its holder. 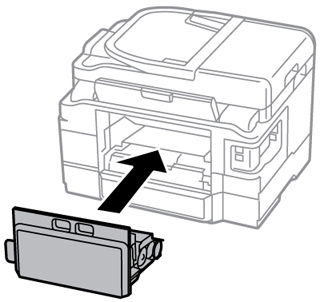 Note: Do not tilt the used maintenance box or take it apart. Warning: If ink gets on your skin, wash it thoroughly with soap and water. If ink gets into your eyes, flush them immediately with water. If ink gets into your mouth, spit it out and see a doctor right away. Keep the maintenance box out of the reach of children and do not drink the ink. Place the used maintenance box in the plastic bag that came with the new maintenance box. 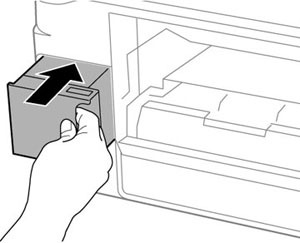 Seal the bag and dispose of it carefully. Insert the new maintenance box into the holder and push it all the way in. Reattach the duplexer (rear cover). Published: Feb 1, 2013 Was this helpful​? Thank you for the feedback!